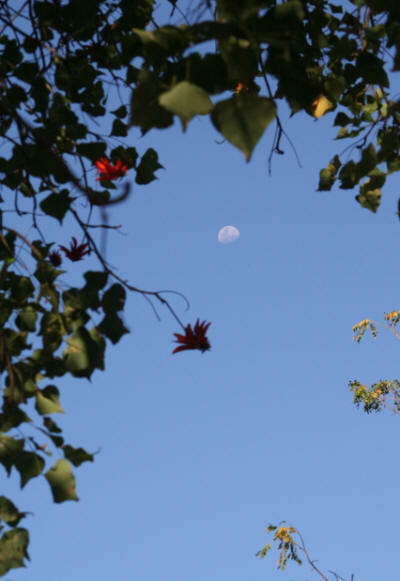 We were back at Punda Maria in early August and were able to see the late winter blossoms of the Common Coral tree. There were 2 of these beautiful bright red (coral) spectacularly flowered trees just outside the huts H7 and H8 we occupied. This tree became a favourite of mine that day and I got a sore neck looking up into and through the branches. Not only did it offer the perfect venue for "late afternoon tea" for the sunbirds we would photograph, and a haven for a pair of Woodpeckers but it just so happened also to be in the perfect position at the right time to get a good shot of the moon passing through too. This view alone says so much about the Kruger and why I repeat, ad nauseam no doubt, that the Kruger is FAR more than the Big 5. We saw a number of Coral trees on the circular drive around the Punda Maria camp. 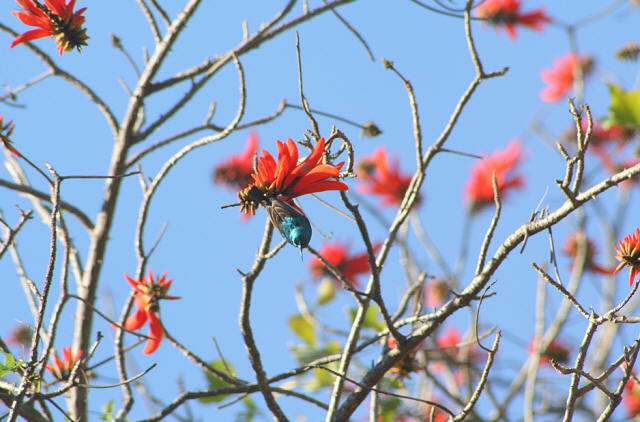 Not only were these Common Coral Trees a beautiful sight in their own right but the flowers had attracted 3 species of Sunbirds we were able to photograph although with some difficulty since they moved around so quickly and the branches flowers and trees made focusing a bit tricky. 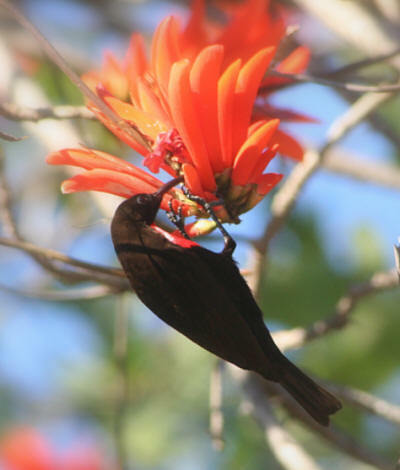 The blossoms of this tree are unusually shaped, large and seemed to be perfectly adapted for the long beaks of the sunbirds. 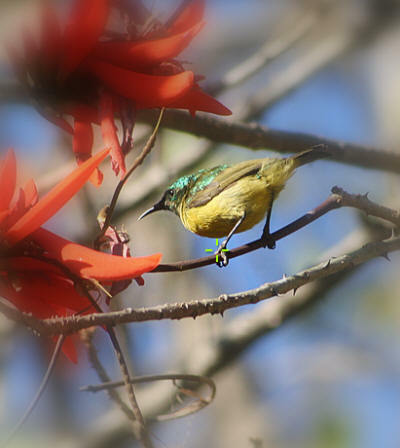 The Collared Sunbird has the shorted bill of all sunbirds which helps in diagnosing the bird. These birds are bright yellow on the underparts with a bright green head. It enjoys riverine and dense woodlands as habitat. The White-bellied Sunbird the male shows a bottle green head and white belly with like so many other sunbirds the female taking a back seat in the plumage area being essentially light brown with an off-white chest. 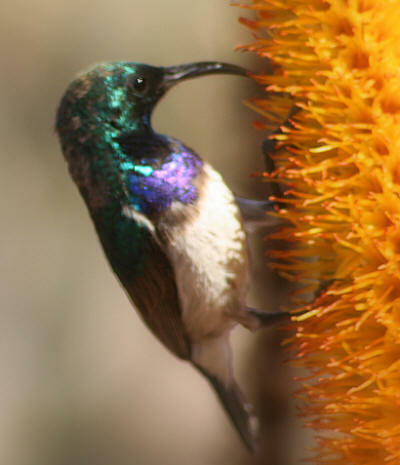 The lower image is the Sunbird on an aloe type plant photographed a couple of days later at Mopani Camp. This shows perfectly how useful that long pointed beak comes in useful for extracting nectar. A pair of Cardinal Woodpeckers Cardinal Woodpecker ( Dendropicos fuscescens fam. 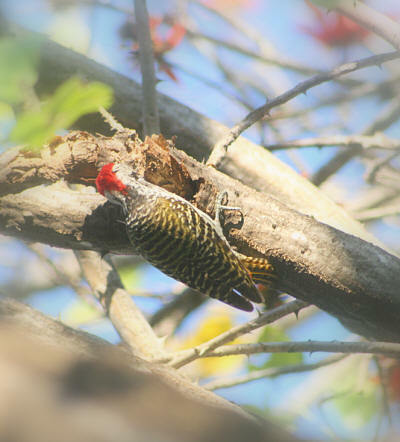 Picidae) Kruger Park Birds & Birding. had also been working hard in the tree by the looks of the "pecking" that had been carried out on this single branch. . 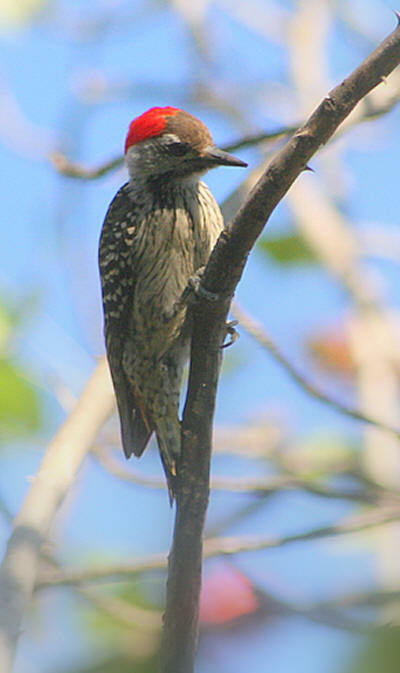 The second picture is a close up of the Cardinal Woodpecker at rest.